Kirsty arrived as she always does - about 30 minutes later than arranged. Sure, she insisted she wasn't behind the delayed flight up to Cairns, but I knew better. I actually didn't recognize her for a second with her hair down, which foiled my plan to hide until she walked by and then tap her on the shoulder, but at least I had a piece of cheesecake waiting to surprise her with. After a quick driving tour (included for all guests) we dropped her bags off at the hostel and took a walk around Cairns. Which is to say, we ambled around downtown, walked to the lagoon/pool and muddy croc-dwelling shore, stopping to do some chinups and play around in Muddy's Playground. Both were much more fun than they should have been. Tomorrow, our trip down the coast would begin in earnest. Wow! Through the magic of the Read More(tm) button, you've been whisked in to the future. Today is now tomorrow, or specifically, Aug 17, which is also the past. Time travel is not for the faint of heart. We took the Friday and the degrading weather to flee north to Port Douglas and specifically the Daintree Rainforest since Kirsty had not been this far north. The rainforest lived up to its name, but we did have lunch and a nice bit of sun along three mile beach. We were back in Cairns in time for dinner and made it a short night - after all, it's not every morning you wake up at 4AM to go hot air ballooning! 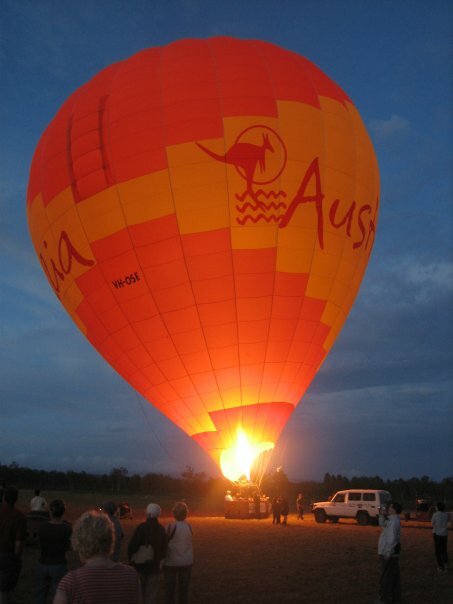 After a prolonged, winding, and dark passage up to the Atherton Tablelands, we were in a field as the sky grew lighter watching the balloons, still on their side, fill with hot air. The sky grew pink and the first group went up while we did a balloon chase that lasted about 500m. I was a little disappointed that we weren't on the first group, but we were up soon enough and it was gorgeous: warm, scenic, and I suspect a more interesting ride than the first group got. Kirsty and I both loved it. Then, the White Water Rafting followed right on its heels. The river was quite technical, meaning lots of rocks and difficult passages, but also not much water. It was still lots of fun (especially our group) and we did get to hop out down some decent rapids, which was a real highlight. Unfortunately for Kirsty, the raft was not fitted with a washroom, but otherwise great fun. It had been a long Saturday and we were both pooped pretty early, which let us get an early start on Sunday. We drove down to Townsville, stopping to do the Millaa Millaa waterfalls and more importantly have what we both describe as the best chai latte ever and some cheesecake at a nearby place. We also found some nice other waterfall you could probably slide down, but it was rainy and wet and neither was up to finding out. 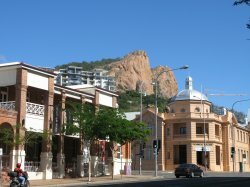 We arrived late in Townsville, which is to say after 7:00, and the hostels were dodgy and closed, the apartments full and closed, and that left only hotels, most of which were booked up for some event passing through. Kirsty managed to find us a decent hotel anyway and we spent the night there fueled by the only 'restaurant' still serving anything even resembling food. Well, sort of.